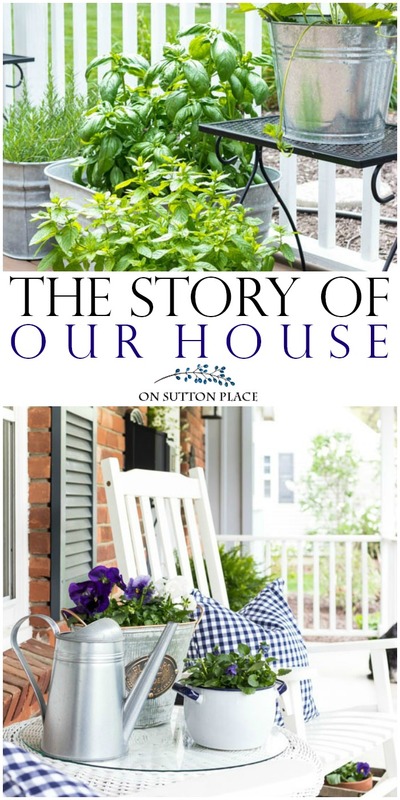 The Story of Our House | From the Beginning: Learn how the house behind the lifestyle blog, On Sutton Place, became a home, one DIY project at a time. Back when my blog was very new, I published a post that told the story of our house. That post is buried so deep in my archives that even I had a hard time finding it. So…I thought I would share the story again from my perspective now. As a self-employed blogger and photographer, a reluctant empty-nester, and as someone who sees the glass as half-full and not half-empty. There are so many things about this house that I would still love to change or update. But at the end of the day, it’s our home…and it’s been a wonderful place to raise our family. We moved to Sutton Place in the spring of 1993. It looked vastly different then. Our yard was full of trees both in front and in back. We had no grass, no thriving landscaping and absolutely no curb appeal. We bought it mostly for the location and size…and at the time, we thought we could afford it. Shortly after we got the keys, I came down with the most dreadful case of buyer’s remorse ever. There was so much more to do than I realized. The amount of money it was going to take to fix everything was overwhelming. I couldn’t look at the big picture without wanting to cry…so I took things one at a time. Slowly projects were completed and improvements were made. By slowly I mean at a snail’s pace. A great deal of thought and budgeting went into every project that we completed. I love to DIY but there were limits to what I could do on my own. My husband has many gifts, but being handy is not one of them. So with the help of various contractors and handy-men over the years, this is what our house looks like now. We have, by necessity, removed most of the trees from the lot. Our plumbing was compromised by tree roots. Our foundation was cracking. Our patio, porch floor and garage floor were cracking as well. We have pretty much replaced or fixed everything. Two things we haven’t addressed are the windows and asphalt driveway. I would love to lay a stamped concrete driveway but I’m not sure that will ever happen. Time will tell on that one! My very favorite project has been painting the front door navy blue. I used this color in my kitchen and loved it so much I put it on the front door. 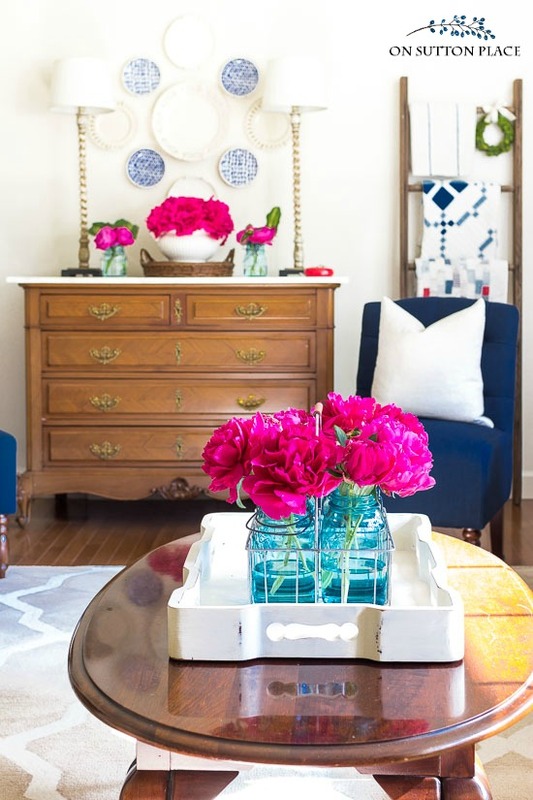 The color is Naval by Sherwin Williams and it is the perfect, classic navy. We used a gray primer and then two coats of the Naval. My most frequently asked question, hands down, is “What is the color of your front door?” It’s been several years and I love it as much today as when we first painted it. 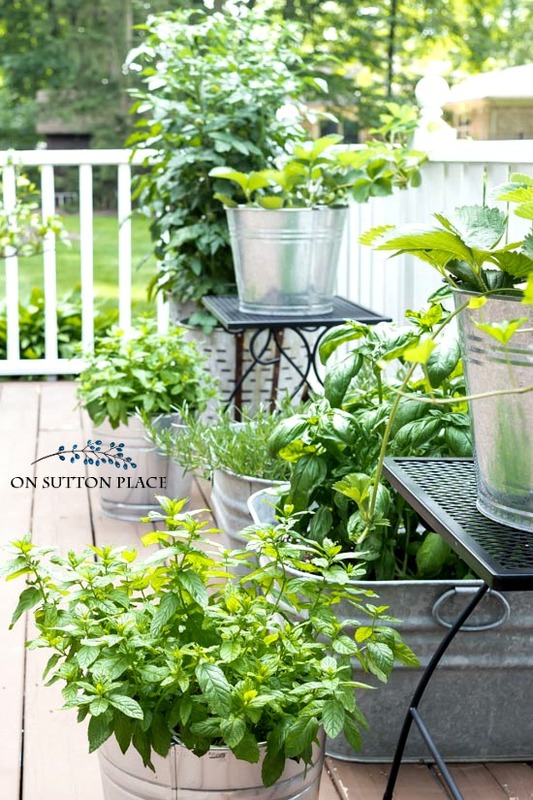 Outdoor projects were at the top of the list during the spring and summer months, and the inside projects took place during the winter. The biggest project we have completed on the inside is definitely installing hardwood floors on the first floor. A close second was when we renovated our entry. We removed old wallpaper, painted, tore up old carpet, refinished the stairway treads & banisters and painted the stairway risers. Read about the entry & stairway renovation. We’ve painted every room in the house, most more than once. Every room is decorated with family heirlooms and things we love. This house tells the story of our family and I think that is what I am most proud of. When we bought this house, I felt like I was visiting someplace and I just wanted to go home. It wasn’t until we began to slowly make changes and improvements that it started to feel like mine. Now I can’t imagine living anyplace else. Owning this home has been a character-building experience. I have had to learn patience and perseverance. I’ve learned that hard work really does pay off. I’ve learned to never, ever under-estimate the value of a good handy man. Now that I’m self-employed, after years of leaving here every day, I can stay home. To say I am thankful is an understatement. This house has become so much more than just a place to live. It’s really become my whole life. Focusing my blog around my home has been life-changing. The two together saved me from a crippling case of empty nest syndrome and for that I will be forever grateful. This house is many things. Most importantly it’s a safe place for my family. At the end of the day this is where we return. It’s where my heart is. visit the Shop My Favorites page! Ann, I love your home. It always looks so warm and inviting. I thoroughly enjoy your blog. Yours is one that helps and encourages me because you provide great advice and how-to instructions. Even though I am sometimes late reading your posts, I eventually catch up and enjoy a couple of hours of great Decor and stories! I enjoyed reading your story and look to more! I Love your home. It is beautiful . Thank you for sharing. This is the first time I’ve read your story and seen a full picture of the outside of your home. And it is more than a house, it is a home. I know I’m not saying this right, but you’re so normal and I thank you for that. You are so inspiring and I hope people feel the same warmth in my home, as I feel when I see yours. Thank you, Ann. Your home is lovely but better yet is how you ecpress your love for family and home. I can relate to your buyer’s remorse. We looked for 18 months for houses before reconsidering and ultimately purchasing our current home. We are old house people living in a mid century home. But, I do like the floorplan, a lot. Our first project, besides removing zebra striped wallpaper and painting was to remove the disgusting, I don’t even want to think about what was in it, brown carpeting and replace it with hardwood. That single act changed my entire perspective. We have moved on to replacing the kitchen and are currently gutting a bathroom because the subfloor is rotten. The life of a home owner, always something to do. If we weren’t handy, we might not have taken on this challenge. So glad you have found happiness in your current abode. I found your blog while searching Pinterest for solutions to my recessed picture window in my living room. We pretty much have the same window as you and I loved the bench you have! This post has really resonated and inspired me. My husband and I recently purchased our first home and sometimes the to-do list has me questioning if we bought the right house. Our homes look like they were built around the same time with a similar style, and your list of everything you’ve done looks nearly identical to our list of things we need to do. It’s hard time to find the time to get much done with three little boys under the age of 5 running around, but it’s motivating to see someone who has done it! You’ve definitely gained a new follower in me! Hi Emily…thank you so much for writing. My kids were 5 and 8 when we moved here. It took me forever to get a project finished…but I just kept plugging away. It took years and years. Just take one thing at a time and keep breathing! Thank you for sharing your perspective and how you have come to be comfortable with your home. I love your blue door! 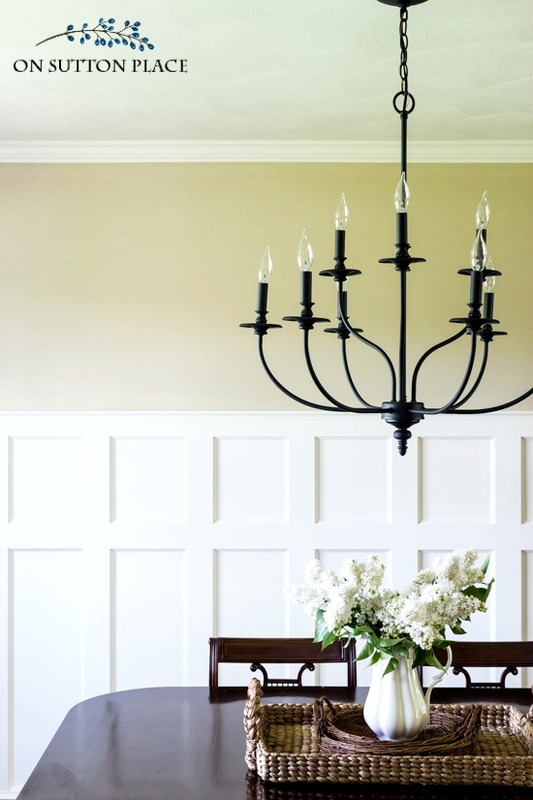 Your home is one of my favorites in the blogosphere. Is is always so welcoming and cozy. It feels like home. Thank you for inviting us in and sharing your wonderful story. I always enjoy reading your posts, Ann…..but I think this is one of the best you’ve written! Your love for this home and your family really shines through. Well said Ann and so very true for me too. I love your home. I enjoy your blog because your home is beautiful, yet it doesn’t seem unattainable to me! Thank you for sharing how long it has taken! I often become frustrated and impatient with my decorating to do list. You inspire me to keep moving forward! Beautiful home! Always look forward to your posts. Thank you for sharing.! Oh, Ann. I loved reading this post. I’ve followed you as you left full time work and have really bloomed on your blog. I’m thrilled that you are so satisfied with your house and, more importantly, the life you have made as a blogger. Good luck in the new year. I loved this post! I have been following you for quite awhile and I always eagerly look at my inbox for your posts. It is amazing how much love and care a house (home!) takes. It is well worth the money and sweat that we put into our home projects. I always enjoy reading your posts xo. My house is the same model as yours and we have been in the same situation…replacing and fixing everything!! Like you said though, it is my home And I love it! Thanks for sharing and happy new year!! I appreciate your candor regarding empty nest syndrome. Hearing both your vulnerability and therapeutic projects made me feel better personally. Congratulations on all of your successes in your house/yard renovations. Hi Heidi…I am still not a gracious empty-nester but I have learned to live with it. Some days are really hard (even now) and some are just fine. I try to be grateful for the time I have with my kids and not dwell on the time I don’t have. Easier said than done! Ann, all your and the handyman’s hard work has really paid off. You really have a house you can call HOME. Thanks for this posting as I hadn’t seen all of the improvements you’ve made over the years. Happy 2018. Your home is beautiful…as is your post! We have lived in several homes over the years…and have built three from scratch. I love the home building process and have changed styles over the years, but always try to be frugal ( if possible) and maintain cozy atmosphere! Both my husband and I retired in January, have no children, and decided to downsize even more and move to a 55+ community – and then we found a Continuous Care/Lifetime Care community that was building a new apartment building and thought…that is perfect for us. It was sold out, and luckily for us someone backed out in April and in 6 short days we decided to go for it, sold our home, and started picking out finishes for the new place. January 8th will be our 41st anniversary and our 6th month anniversary of living in our new space. We really LOVED our home, but we are SO enjoying apartment living, meeting new people and making new friends, and enjoying all the amenities that come with our new home. In this cold weather it is a joy not to have to go out the driveway for the mail! Will continue to tweak our new space…and enjoy a cozy life. Look forward to more of your great posts. Happy New Year ! Ann- you are a fantastic designer! Your home looks beautiful and I’m jealous of your eye. I’m so glad I found your page. I love reading about your love of home and decorating. Was also wondering if you could offer your advice as to how to start up a blog?? ?i have no idea how to start one up. Ann, i’ve been following your blog for a few years now and always look forward to your posts. As I read your post i feel like I’m visiting with a friend. I love your style and the way you have worked and continue to work to make your house a home. Thank you for opening it to the world…may 2018 bring you many blessings. Hi Margaret! That chest is not an antique. I inherited it from my mother-in-law but she purchased it in the 80’s from Bombay. Do you remember them? They had a catalog and some retail stores. They have since closed I believe. It’s super functional and fits perfectly on that wall. Sounds great and so interesting; you’ll be thrilled (or maybe just pleased) that the chest I have was purchased sometime around 1948-50 – I remember it being in all the houses we lived in when I was growing up. That’s a beautiful piece and you decorated it and everything in your home beautifully! I love your house story. I have similar chapters in my life. I have moved many times in my life and each time did some renovating of some kind. Hopefully always leaving it better. Thank you for writing your story. It is nice to see the love of a home expressed. I so relate to the empty nest syndrome. I love nesting around my house and that my children and two grand babies come on Sundays for dinner. My projects aren’t finished but the process is therapeutic. Love your blog! I just strolled through your garden, nicely designed. Thank you for a respite from our very cold January. You mentioned difficulty in achieving heavy blooms on hydrangeas. A few years ago, I came across Burpee Seed Co, Sea Magic “fertilizer”. It truely is magical how, by applying it to the soil around my hydrangeas which grow in sandy soil, I achieved blooms on one plant that rarely bloomed and very large blooms on others. It is used as a supplement to regularly used fertilizers. I am in Michigan. Love your style and all your hard work. 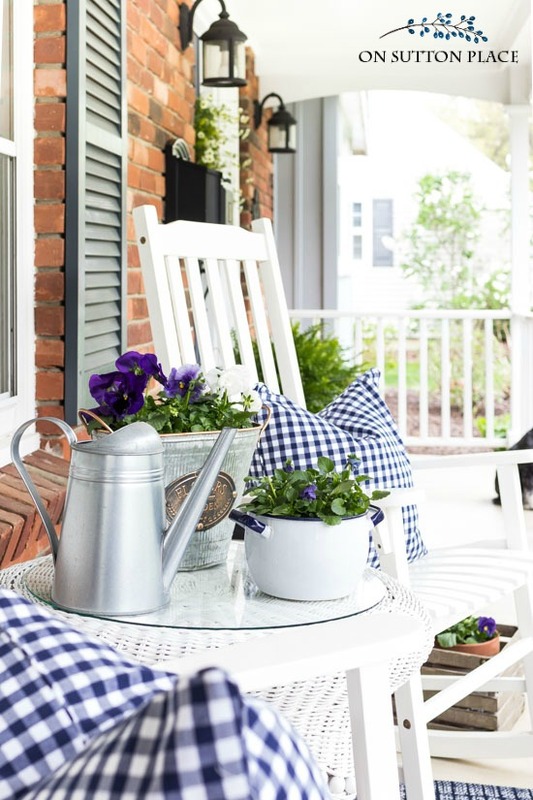 Thank you for sharing the beautiful spring/early summer photograph of your home. The photo brings a spark to my day as I look out the window at the snowy, cold landscape in northern Indiana. I also appreciate you sharing the time, energy and planning necessary to remodel/update with a budget. My husband and I have always done so and I think I appreciate every change even more. What a beautiful and inviting home you have made. And I use several of the recipes you’ve posted (the baked spaghetti is a family favorite here). Your blog is my favorite. I’m looking forward to what you have in store in the new year. Ann, you have a lovely home. I have printed several of your free printables and framed them. They have made a great addition to my decor. Looking forward to seeing any new projects you have for 2018. I have enjoyed watching your house evolve over the years Ann. You have done a wonderful job! Happy New Year! Good morning Ann, I remember reading your posts about your home. It has evolved from a wood surrounding house that you and husband with the help of good workmanship to a warm and welcoming home. I’ll always love your blue and rich yellow colors with brass/gold accents, very inviting. If you made the door arrangement is there a tutorial? It is gorgeous and your home is stunning! This is a wonderful post, Ann. I can so identify with so much of what you have done. We purchased our home in 1990 with a long “to do” list. And now, 24 years later, we are still “to doing”. It has been such a blessing. You have a beautiful home! I want to re-decorate! What is on the entryway floor? It looks interesting. Hi Tana! 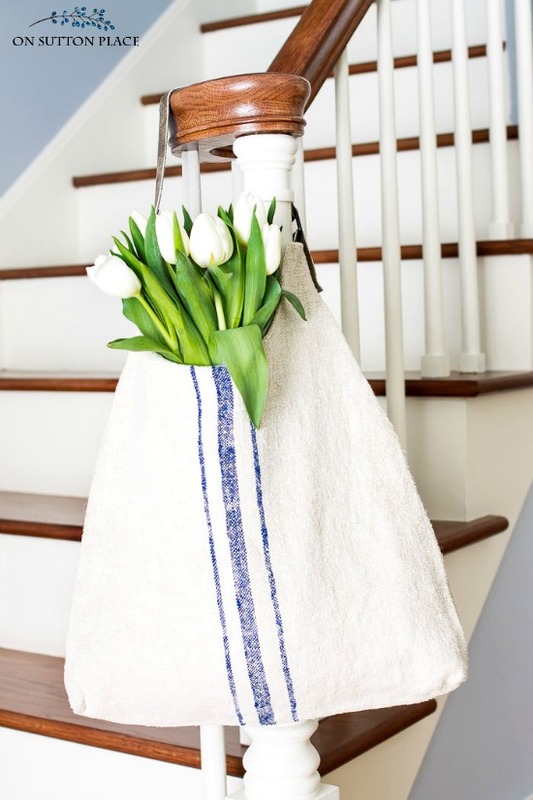 The mat in the entry is from Decor Steals. It’s a bamboo mat and they offer them once in a while with different typography. If you subscribe for their updates you will get an email with their daily deals. It wipes up just like the floor. For this time of year it’s the perfect thing for in front of the door! You are welcome Becky…thank you for the lovely comment! Your home is so pretty, Ann! Love the blue! Such a sweet post-so nice to learn more about you and your home. Gorgeous photos- and I love your front door color!! Your home is always so perfectly neat! I wish I could accomplish that! Love your home colors. I hope I am not asking a question you get too often, but what are those beautiful flowering shrubs along your walkway? Hi Ann home is beautiful, could you tell me what the name of the flowers along your front walk. Your home is lovely, Ann. You actually had me teared up at the end. Love that picture of your stairway. Makes me want to rip the runner off mine! Ann not only is your home incredibly beautiful but hearing about your heart and your passion for what you are doing makes it shine even more beautifully! I loved hearing the story of your house and I’m so thrilled to be part of this tour with you! What a lovely story and I’m so glad you grew to love your home and it helped save you from empty-nest despair. Again one of my most favorite blogs. but I felt like I was on vacation somewhere. I have also painted, completed big projects, still one more to complete, hardwood floors – but for some reason it still does not feel like mine. I think I miss the space of outside the private place. I keep looking at homes, but I keep wondering “why am I leaving here” I guess it is going to take some time and patience – Thank you for your story. It has helped. Oh Ann… I know that overwhelming feeling when you realise there is way more to do then you originally thought, but look at where you are now. Your home is so lovely… and I think I just found my new colour for our yet unpainted front door. Love that Naval blue!! Pinned and shared for Hearts at Home. Ann, your home is one of my favorites. It is so pretty and fresh with traditional flair. Love it all! Ann, I don’t comment much. I know! Don’t fuss at me. But anyway I loved your story and love your house. I’m now living in the most precious little house I’ve ever seen. I know how you feel when you love every inch because you touched it in some way or another. It really makes life better. Your such a sweet heart, keep writing. Hard work and obviously the love that’s been growing in your home for years shows in the pride you feel! Your home is magnificent! Would love to see a picture of what it looked like when it bought it. Just go for it Susan! Believe me if I can do it, anyone can. I had no idea what I was doing on any of my reno projects. I just figured it all out as I went along! Your home is beautiful and I absolutely love the front door color. I am so confused about what color to paint our front door. I love red, your blue is beautiful (blue is my favorite color) and I love yellow. Our house is currently cream but we plan to have it painted gray in the spring. We are in Georgia and when it rains the red dirt splashes on the house and looks terrible. Also, We are new to Georgia and what hints would you have to locate a great, honest, reasonably priced and hard working handy man. I love your blog and your taste. Thanks for sharing. Debbie, I have a friend that painted the front door of her gray house yellow. It is beautiful with the house numbers on the door. I have seen pictures, probably on Pinterest, of gray houses with yellow doors. I love them. 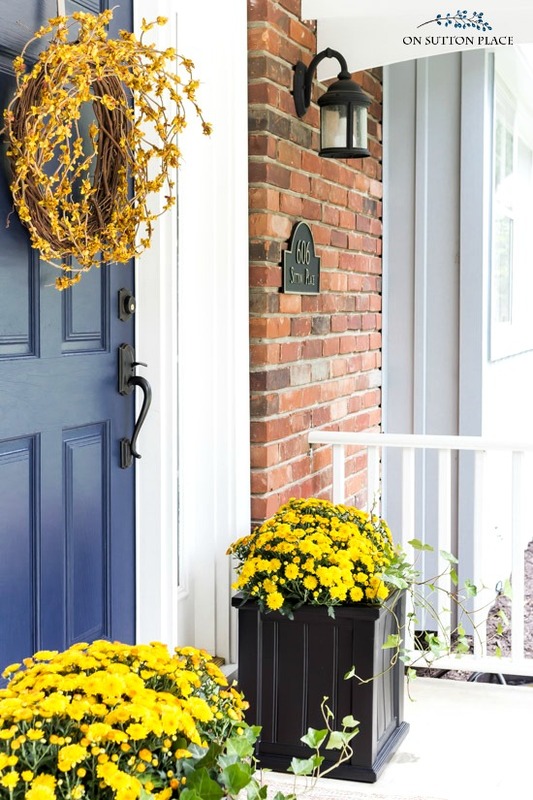 Just do a Pinterest search for “yellow front door” and see what comes up. As far as a good handyman, ask around. Co-workers are usually a big help. I found my best painter ever from the girl who cuts my hair. My son lives in Chicago and uses Yelp all the time. You could also try that. Good luck! This post was wonderful to read. Your blog is so motivating. I love your style. I now want a navy front door! What color are the walls next to the stairs? It looks to be a grey or blue grey…? lovely!! 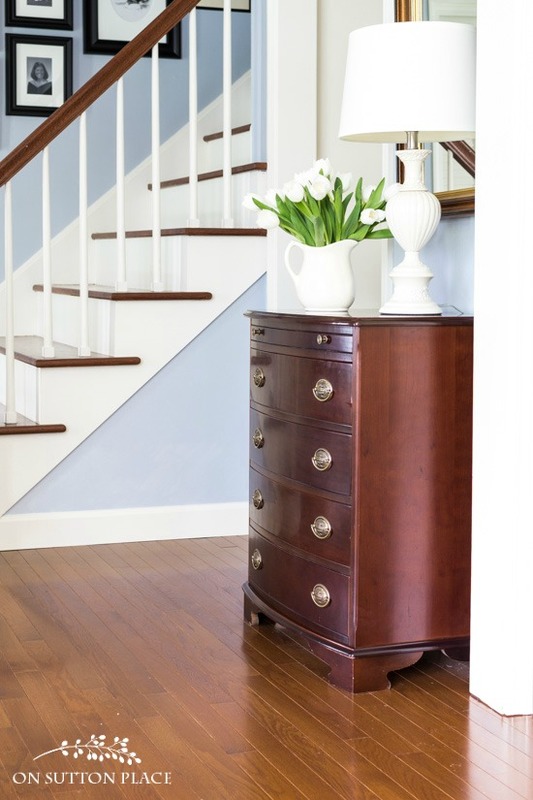 love the stairs…..we plan on ripping the carpet up and the redoing the stairs….either stain or paint…not sure yet….or maybe a combo….I keep looking online for one that says THIS IS IT!! Ann, someday I would love to meet you in person. Your blog posts warm my heart and I love your sincerity. You have quite a beautiful home – one that you have made that way with such caring and creativity. Thank you! Oh Mary…this is one of the nicest comments ever. Thank you so much and I would love to meet you too! Your home is absolutely beautiful! Thanks for sharing your story! I knew it, I knew it…we are kindred spirits! I love the story you shared Ann! I love your writing & your home. My kitchen isn’t white either (it is red ); I renovated & renovated my home too ( and it is still never done ); I am blessed with a non-handy husband, so I too “call the guy” when I can’t do it myself; I know the day is coming that my girls will use their wings…and I think having my blog will make that transition easier. Glad to know it does. Thank you so much for being such an asset to the Tour! Thank you so much for asking me to join…I have loved it! What a great story ann. Its a special treat to dig a bit deeper into the souls of a favorite blogger. Thank you for that. That blue front door is by far a favorite of mine now! We live in military base housing and can’t really do too much with the structure or paint but I love to save ideas for our possible ‘someday’ home! I like how you said it was a long process. I sometimes forget that whenever I look at blogs or pinterest before/after pictures. It was money saved up and time in-between working on the projects as well. Ann, your navy front door has become the perfect foil for all your pretty wreaths that you make, and this is one of my favorites! 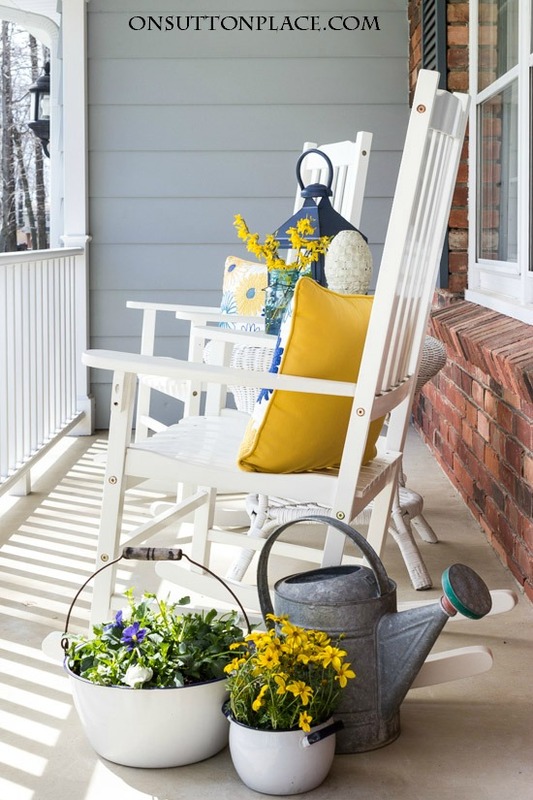 Your home says, “Ann lives here!” beginning with those gorgeous yellow Knock-Out roses out front! I love the Navy front door and the front porch. Thanks for sharing your homes story! You have a beautiful home – I love your sense of style, Ann! We have solid brown brick so I don’t know if it would look good but I do love the color! Ann, you have done a lot of changes in your home! I love the entry and that front door color is beautiful! Ann, You have such a beautiful and welcoming home! I am also a big fan of your front door color! What a lovely post about your home. Your story of renovation is so similar to ours. We are in the process of redoing every room! It’s a wonderful and hard journey isn’t it! 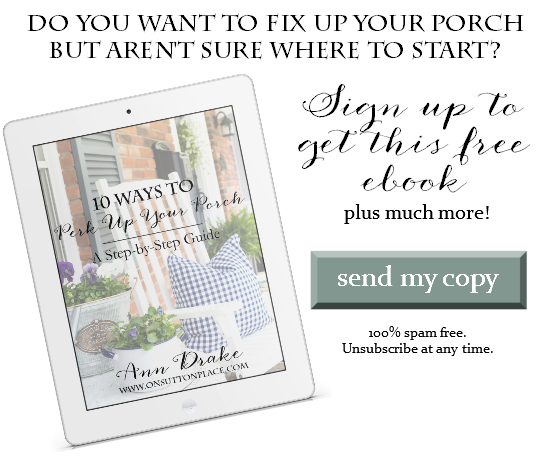 I look forward to peeking into your home every day via your blog! This is a great blog, full of fun ideas and yummy recipes. Thanks for sharing! Ann, your home is beautiful, its story is inspiring. Hopefully this is our year to bring several updates to our home. And yes, your navy blue door ROCKS. What a beautiful story, Ann! Your house is so pretty and inviting and I absolutely love how you have made it your own. I love your style Ann. You made that home even more beautiful than it was before. applause on a job well done.. Thank you for sharing your door color.